The U.S. Army has proposed several helicopter landing sites in the North Cascades for pilots to practice flyovers and high altitude landings. Some of the proposed landing zones have raised concerns because of their proximity to popular recreation and Wilderness areas. The U.S. Army has proposed several helicopter landing sites in the North Cascades for pilots to practice flyovers and high altitude landings. Some of the proposed landing zones have raised concerns because of their proximity to popular recreation areas and trails. Currently, pilots from Joint Base Lewis-McChord travel to Yakima and Colorado to get experience with flying and landing in rugged mountains. As Americans we understand and appreciate the need for our military to provide the quality training necessary to defend our country when the time for deployment arrives. At the same time, we strongly feel that we can and should be able to ensure that we can achieve military readiness through appropriate training exercises while also honoring the decades of significant investment that the American public, the U.S. Congress, federal agencies and local residents have made over the past several decades for conservation and recreation in the North Cascades. 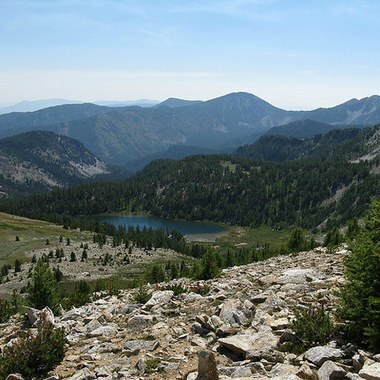 We have concerns with the locations of the landing sites, as many are in popular recreation areas, including "Big Lou" mountain above Ida Lake on Icicle Ridge Trail, a spot popular with scramblers within the Alpine Lakes Wilderness boundary. Another location is in the middle of the Golden Lakes Loop in the Lake Chelan-Sawtooths mountain range between Cooney and Martin lakes. The proposal would allow exercises to occur 24-hours a day on all days of the year except federal holidays. Most of the exercises would likely occur at night. The exercises could last for up to four hours and include air traffic from as many as seven Apache, Chinook or Blackhawk helicopters. In the scoping notice, Joint Base Lewis-McChord officials have said they will consider visual and noise impacts of the exercises. Along with other recreation and conservation groups, we are encouraging army officials to directly address how the proposal would impact hikers' trail experiences, such as noise at night that could disturb campers and backpackers, and visibility of helicopters from nearby designated wilderness areas. The Mountaineers has submitted comments with our Washington Outdoor Alliance partners . We also encourage you to submit your thoughts - learn specifics on proposed locations in our WA Outdoor Alliance comment letter. How would hearing or seeing helicopters impact your hiking experience? If this proposal were to be approved as-is, would that discourage you from recreating in this area? Thanks again to our partners at Washington Trails Association for this blog and permission to re-post. The Army has extended the comment period through November 4th. Follow the above link to give the Army your input on their proposal.